Chisum Filtered Cigars are 100% American made. Chisum little cigars are created with high quality unique blends of mostly dark top-quality Flue-cured, Burley and Oriental tobaccos, quipped with a filter on the end and wrapped in a natural tobacco leaf. Once ignited, each filtered cigar produces a smooth, rich and natural smoke with a long burn, sweet aroma finishing with an earthy taste that’s undeniably satisfying. Farmers Tobacco (based in Cynthiana, Kentucky) developed Chisum filtered little cigars the old-fashioned way, which means they are made the RIGHT way! 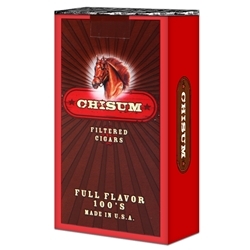 Chisum Filtered Cigars come in multiple styles to choose from, Full Flavor, Menthol, Lights, Vanilla, and Cherry. Chisum Filtered Cigars are the perfect option, if you’re looking for a way to save money over expensive retail brands. Smokers Discounts offers you a great choice to buy filtered cigars online, it’s easy and affordable! Call us for more details!